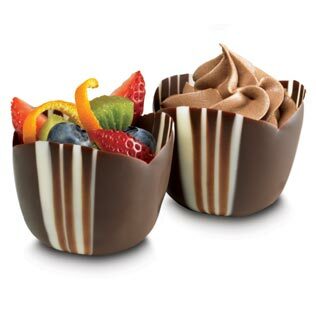 Can someone please help me with tips to make chocolate cups with swirly designs. Something like this. I've tried painting the inside of a cup with white chocolate first and letting it set. Once set, I tried painting it with dark chocolate. But somehow, they end up getting mixed and it just comes up as a normal dark chocolate cup. You can try to make chocolate cups in general by "painting" a small dish/cup with chocolate, and letting it set in the fridge. If you want tempered chocolate, there are techniques for that. But in any case, you've got to consider that different chocolates have different heating/cooling rates, so mixing chocolates with different fat contents (like milk vs dark), or from different manufacturers will (pardon the pun) fudge your calculations a bit as far as how hot/cool the chocolate needs to be. And white chocolate is an entirely different beast, so it has its own melting/setting points to consider as well. Your problem is probably the temperature of the chocolate. As you stated, the chocolates get mixed. That wouldn't happen if the temperature of the chocolate was lower. Try tempering the chocolate, as MandisaW suggests, before mixing the white chocolate in. If the chocolate is mixing, then the second layer is remelting the first layer - this might be because of relative melting points, so the temperature needed to keep the second layer liquid is just too much higher than the melting point of the first, or it might be because of volume - adding a thick layer over a thinner is much more likely to melt because a thicker layer just has more heat. So you can switch the order (first the cup, then the stripes) or the layer (paint the cup with the dark and the second layer is white, or the reverse of what you tried) to try and fix the problem mechanically. Other things you might try include making the whole cup much colder between layers so that the second coat cools faster and doesn't have as much extra heat to melt the first, or just painting on many very thin layers (each layer would then have less heat to waste, cool faster, and give you more control over the design and thickness). This would be more work, though. Not the answer you're looking for? Browse other questions tagged chocolate or ask your own question. Is it possible to temper chocolate at home? Make chocolate with a high melting point? How to make hot chocolate drink thicker? Why did my chocolate tempering fail? How to correctly make chocolate bars?